RandomCoffees is the best way to keep up with your teammates. RandomCoffees helps build great relationships within the company members. RandomCoffees is here to connect you with people from your office that you haven’t met yet in an one/one coffee / Skype / Lunch / Walk. #CoffeeFunTime, #LetsGetTogether, #CantWaitForCoffeeTime, #GetMeACoffee #LetsHaveAWalk #LetsHaveSomeFrechAir #LetsSkype #CoffeeToSucceed. The members can anytime join in or leave the channel!!! Install RandomCoffees via the add to slack button. 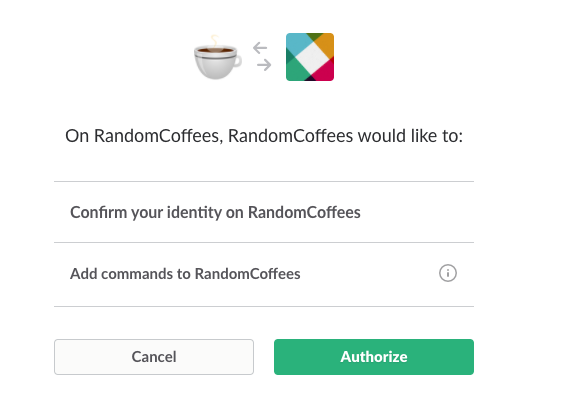 Log into your slack account and use the /invite command to invite RandomCoffees to your channel "/invite @RandomCoffees". Run "/randomcoffee run" to match everyone in the channel for their first coffee. Wait till Monday and everyone in that channel will be automatically matched for next weeks random coffee. Do not wait to get to know your teammates. Look forward to your match each week! Ready to start using RandomCoffees? That's great! Need any help? Send us an email and we will get back to you as soon as possible!